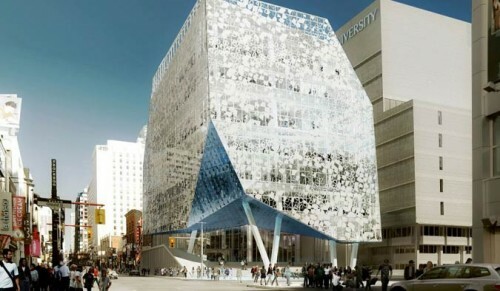 Toronto's Ryerson University announced plans this week for a bold Student Learning Center designed by Oslo-based Snøhetta and Zeidler Partnership Architects of Toronto. 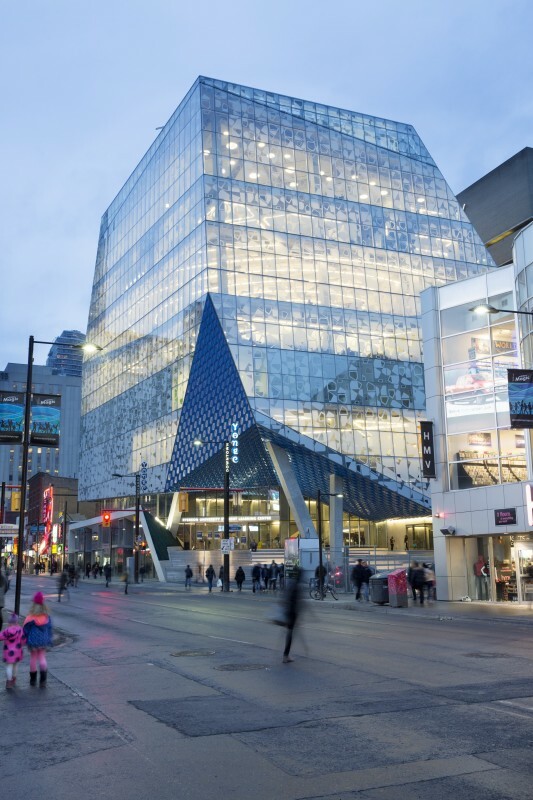 The 8-story structure will mix passive and active academic uses with street-level retail and will serve as the university's front door on busy Yonge Street. The buildings predominantly regular form clad in richly patterned glass has been chipped away at the corners and lifted above the street to provide a more dynamic shape. The main entrance plaza is marked by a similar chipping gesture marked in blue glass leading into a soaring multi-level lobby. Patterns on the glass curtain wall will filter the light quality inside the building. At the core of the building's design was the interplay of introverted study and open collaborative spaces. "The notion that learning is a static, solitary activity is outmoded," said Craig Dykers, Snøhetta co-founder, said in a release. "While it remains important to find places of introspection, it is also vitally important to create places where people can more actively seek knowledge, where social connections can intertwine and where all forms of activity, quiet and loud, can find a suitable home." Expected to earn LEED Silver certification, the Student Learning Centre will feature such sustainable elements as a green roof. The building is scheduled to begin construction later this year with an anticipated completion date in the winter of 2014.